This workshop is a departure from my usual bookbinding classes and definitely NOT a “kit class”. Each student will bring their own book to deconstruct. I suggest a book from your local thrift store; see guidelines below. 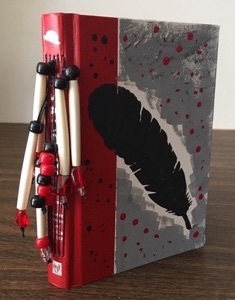 Students will leave the workshop with a unique book of their own design! As a budding bookbinder you might be curious as to how a commercial book is bound. This is your opportunity to unravel the mystery. You will explore the different components that comprise a book by carefully deconstructing a bound book and taking a good look at its various parts. After careful examination and discussion, you will reconstruct your book by reinforcing the spine (if needed) and adding decorative end papers in preparation for hand-binding with a long stitch. You will be replacing the original pages with blank paper and adding a few of your own embellishments along the way. Beginners welcome! •SIZE - The instructor will be providing the paper for this reconstruct so you will need to limit the size of the book you bring to NO LARGER than 5.5"W x 7"H with a 1/2" to 1" spine. NOTE: If your book is larger than suggested you will need to bring your own paper. Be mindful of “paper grain”; we will be folding our pages with the grain. •COVER - The book's cover should be hard bound and in good shape, preferably a nice book cloth or leather-like material. Not torn or worn. Personally, I would choose one with a great title, or you can paint the cover if you choose. NOTE: We won't be spending a lot of time on paint. •PAGES - We're not worried about the pages since we will be replacing them. That said, if you find a book with great illustrations, BONUS!! You can use those in your reconstruct or save them for later. *Special thanks to my Artist friends Libby Rehm (photo above) and Nancy Ryan (photo below) for the use of their photos and beautiful books. You can find Libby on Facebook, https://www.facebook.com/pg/ElegantElkStudios/photos/. ✦A hardbound book (see guidelines above) *Do you need to bring your own paper because your chosen book is larger than suggested? ✦Optional: Beads / Charms to add to exposed binding along spine or use as decorative accent *bead holes must be large enough to accommodate 4-ply waxed linen thread. Note: We won’t be spending a lot of time on paint and it will add time to your project. Better to choose a book with an interesting title. 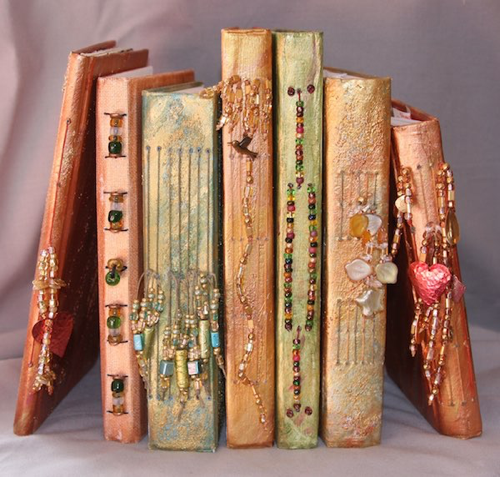 Instructor will provide: Paper (unless you have an over-sized book, then you provide your own), PVA or white glue, a selection of end papers, waxed linen thread, and book-binding needles for use in class.